Last year I did not post anything here during the month of August. By then in 2011, summer had been so inhospitably hot and dry, the garden and I retreated until mid-September. Well what a difference a year makes. Weather has been hot and sometimes dry, but enough rain came this summer to encourage plants to keep trying. August in the garden this year has been a surprise, deviating from the normal rule of brown and more brown. Sweet peas have bloomed all summer, highly unusual. 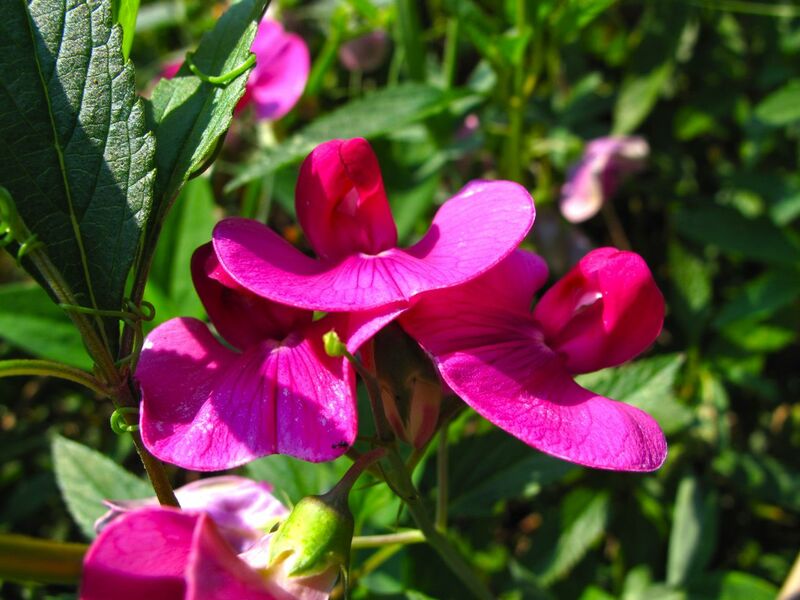 This is not the sweet-smelling type, but rather a passed-along perennial one that has no fragrance, Lathyrus latifolius (Everlasting sweet pea). 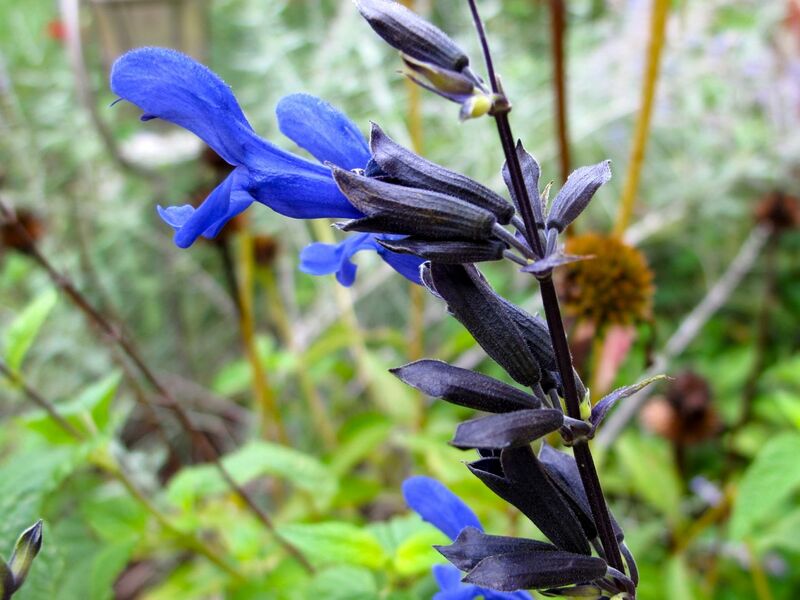 Salvia guaranitica ‘Black and Blue’ stopped blooming during the hottest part of July but by early August it perked up. I suppose extra rain must have helped it. This ‘Dark Pink’ Butterfly Gaura and ‘Angelface Blue’ Angelonia continue to add color in a small front yard border garden that is new this year. 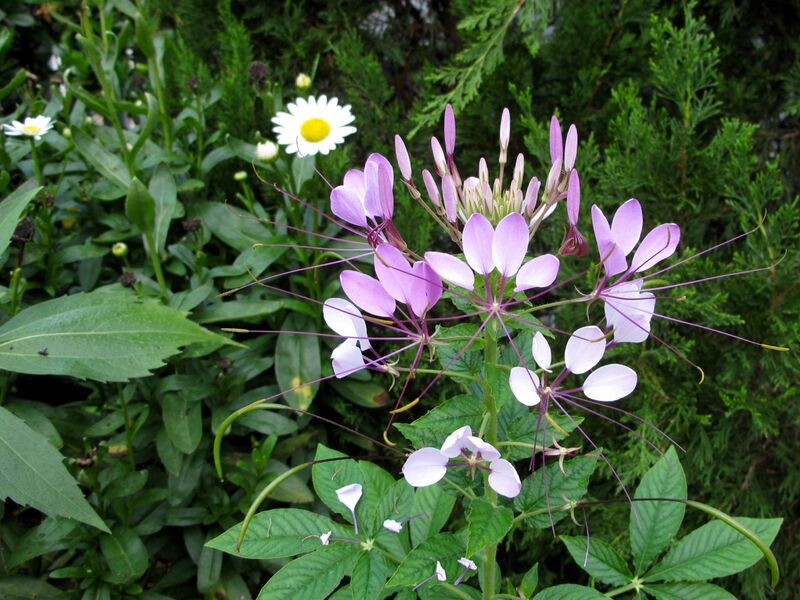 Cleome is an old-fashioned favorite. Many have set seed, others are just starting to bloom. The plant as it transitions through various phases is an architectural marvel. Lantana nearly wilted under the 105F. days of July, but has begun blooming profusely again. 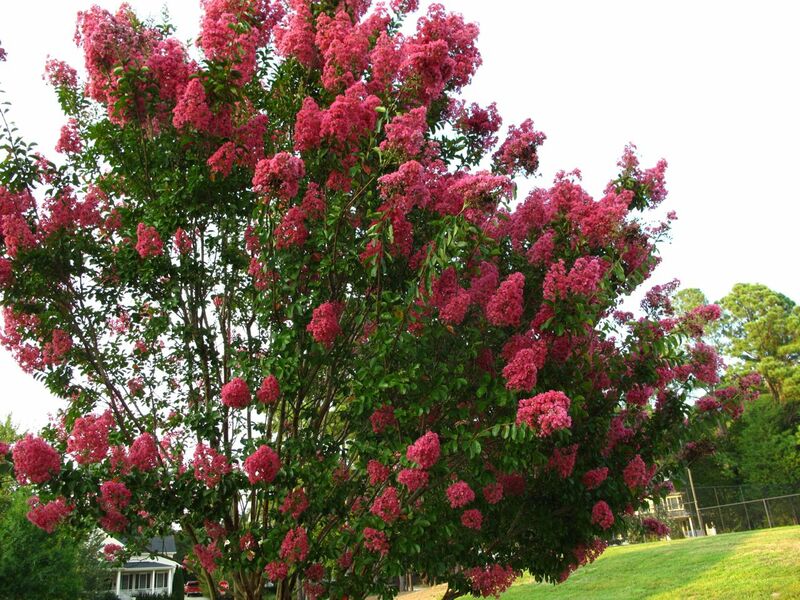 One of two Crape Myrtles at the front walk broke off in a storm just before bloom time in early July. This remaining one has bloomed for eight weeks. The gardenias usually rebloom but with this year’s additional rainfall have been especially beautiful. Euphorbia ‘Blackbird’ (Spurge) is underplanted with an annual, ‘Snow Princess’ Sweet Alyssum. I have never been able to get Euphorbia to survive before, but this one has done pretty well in a ceramic pot. It seems to require a lot of water and I did give it a few extra waterings. 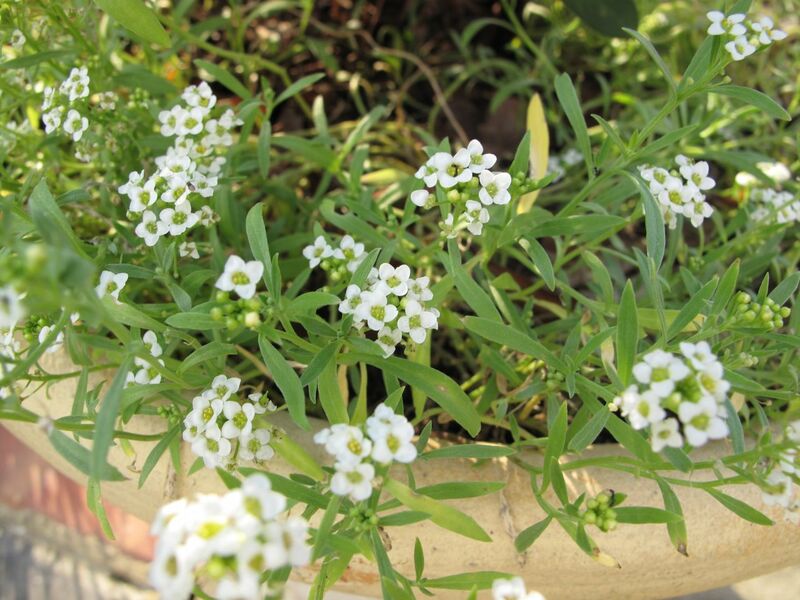 Here is another look at the alyssum. I have not planted this little annual for many years and was happy to rediscover it this year. 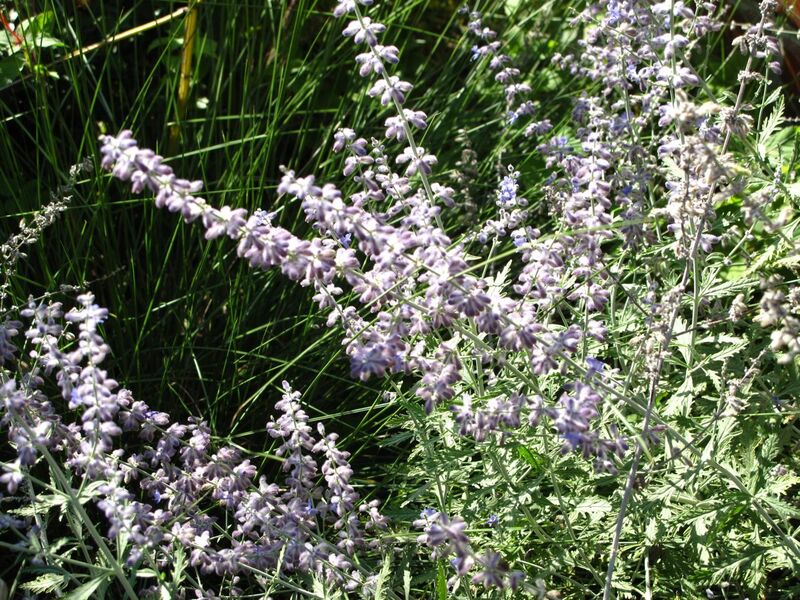 Meadow Sage ‘May Night’ bloomed March until May this spring. It recently began flowering again. 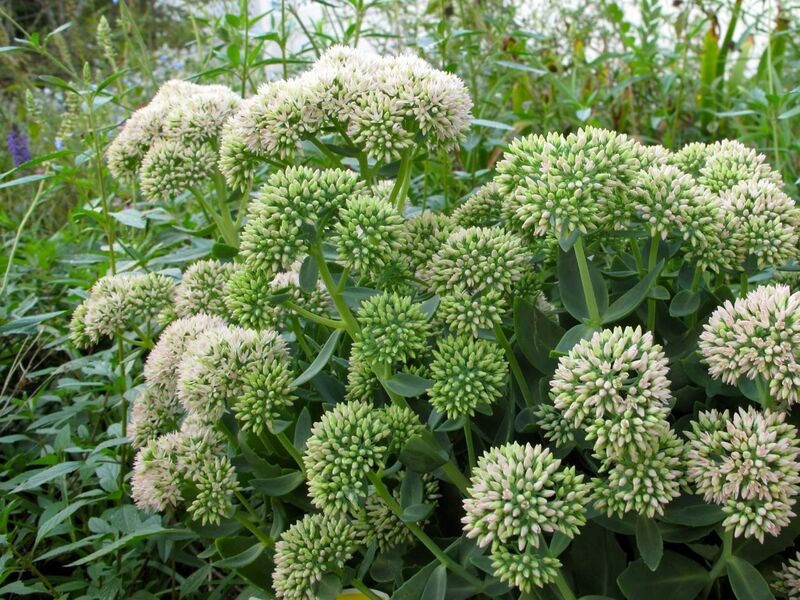 I just purchased three Sedum ‘Autumn Joy’ to add to the borders. 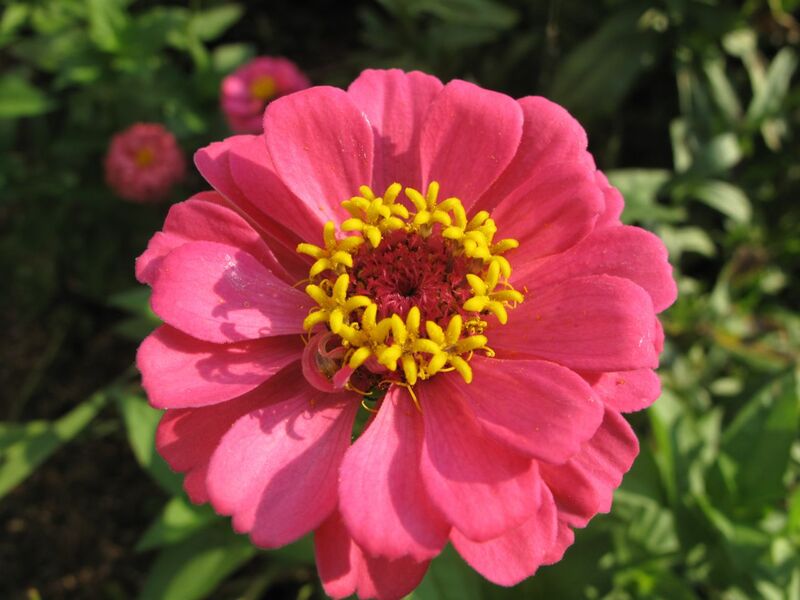 Zinnias were slow to take hold but finally are generating garden color and bouquets. 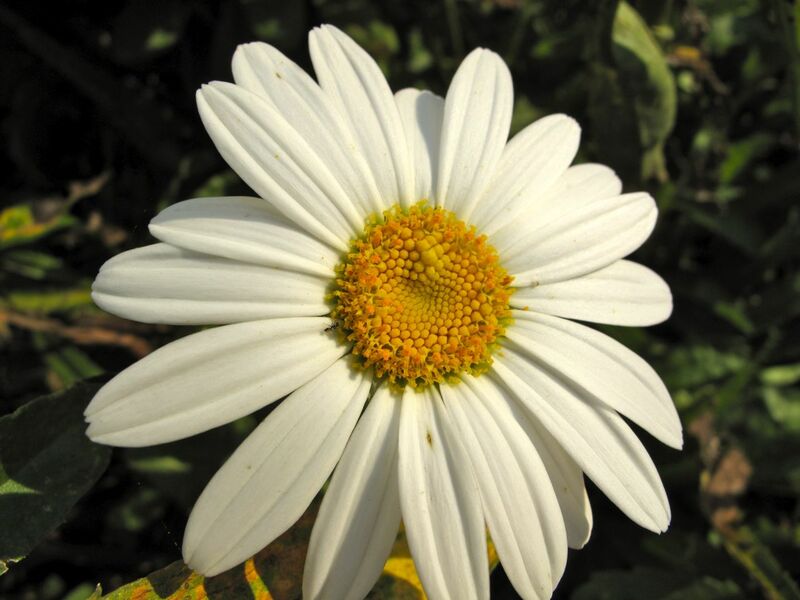 Foliage and flowers of Shasta Daisy dried up under the sering July heat. 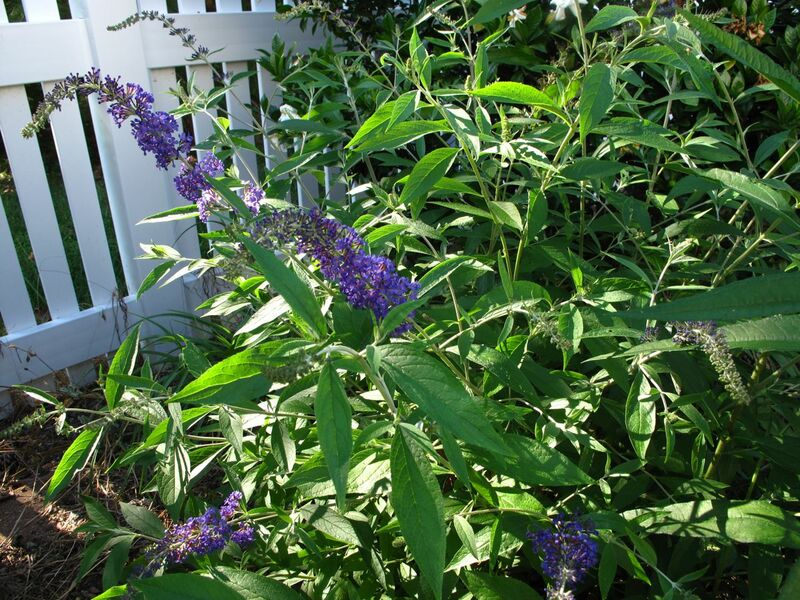 The plants were cut back by one-half and have bloomed sporadically throughout August. 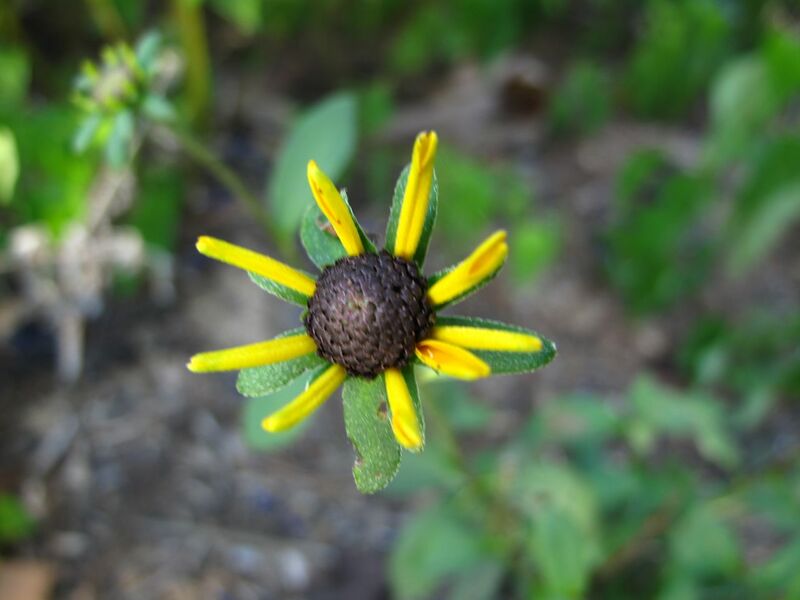 Rudbeckia hirta ‘Irish Eyes’ has brightened the garden since July. Next year I need to remember to stake it. 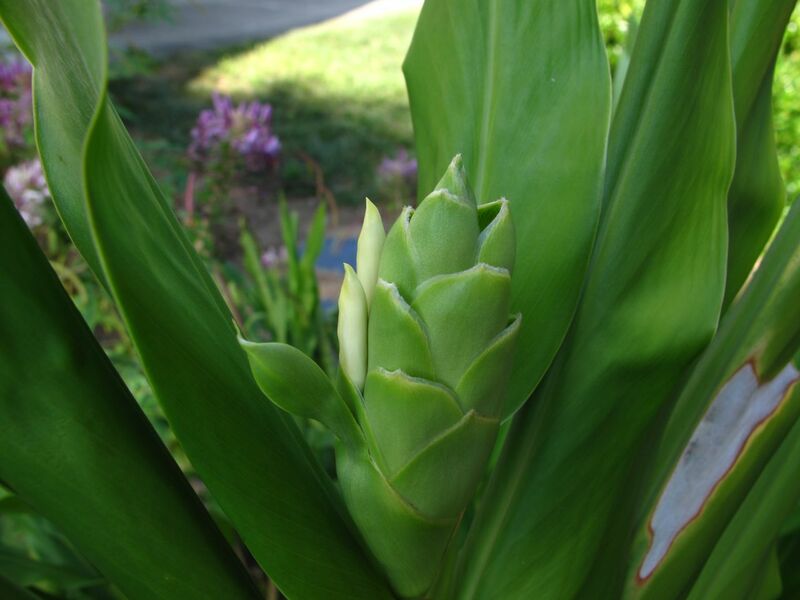 Just yesterday I noticed a flower forming on the Ginger Lily. It is open today a little bit more. Also found two more buds. 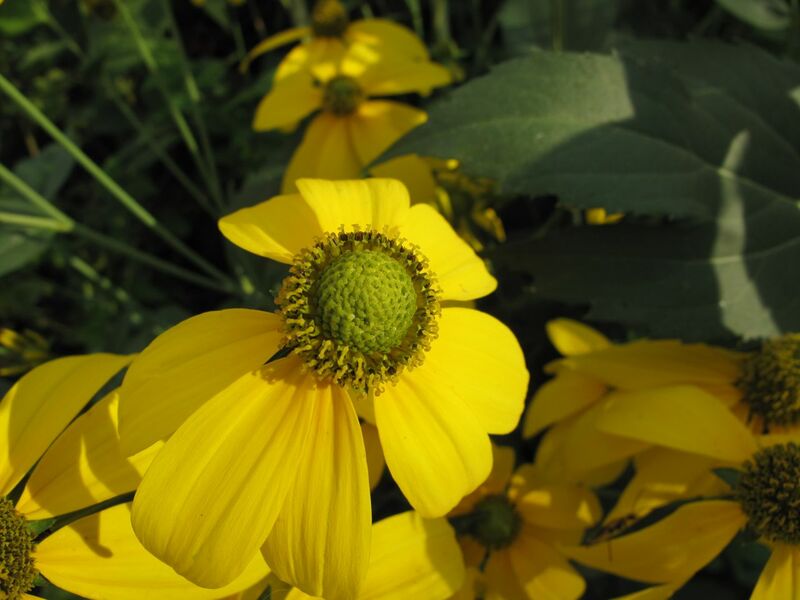 I purchased Rudbeckia fulgida ‘Goldsturm’ (Black-eyed Susan) Rudbeckia fulgida (Orange Coneflower) from the North Carolina Botanical Garden this spring. Deer or rabbit, something has been eating it and for a while it totally seemed to disappear. Now it is trying again. At the Botanical Garden today I saw lovely groups of these in flower. This Buddleja was crushed under a neighbor’s falling pine in early July. 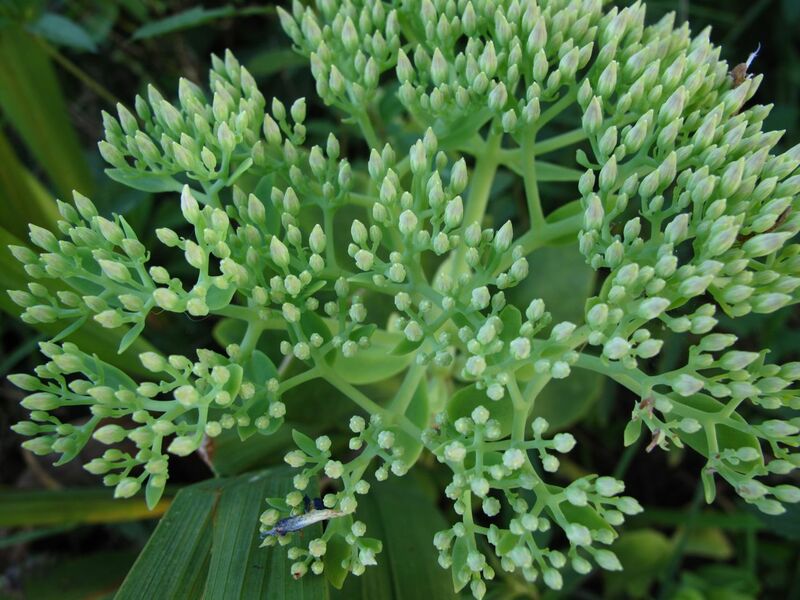 I had been meaning to remove it from the garden anyway because it is now considered invasive in this area. It revived itself with extra vigor. Getting a good photograph of Perovskia atriplicifolia (Russian Sage) has proved difficult, but I wanted to include it here anyway. Having started blooming at the end of May, this Russian Sage is becoming even fuller now and is arching toward a poorly sited Muhlenbergia capillaris (Pink Muhly Grass). Unusually lush, August this year has felt like an anomaly. Even most of the Fescue lawn is still green. No time off for the gardener/garden blogger this month. This entry was posted in garden and tagged nature photography, pass-along plant, perennials, photographing nature, summer garden on August 31, 2012 by pbmgarden. There is indeed a lot of colour still, and everything looks so healthy! 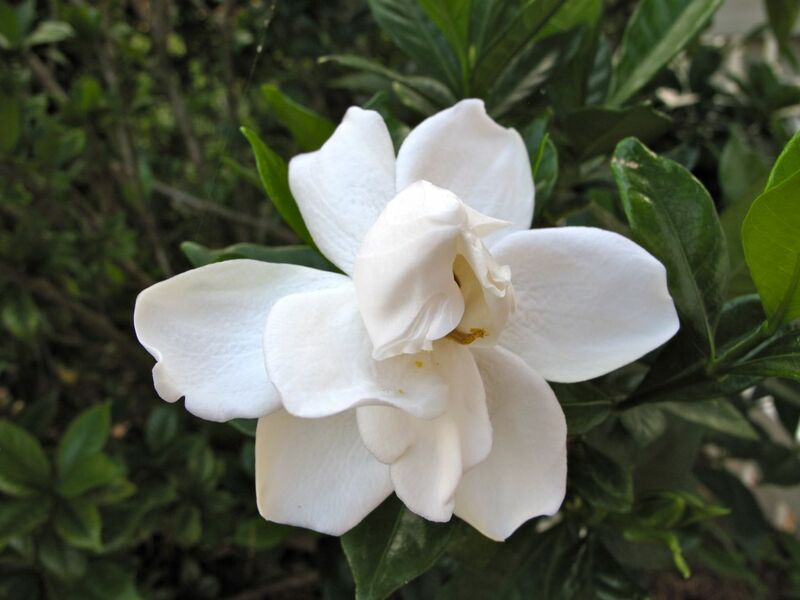 How wonderful to get a second flowering from so many things, especially the gardenia. I love sedums… mine are just showing a little pink. And that Euphorbia is very attractive in a pot… a good idea which I may copy next spring, as I have a large patio pot that will be empty then! 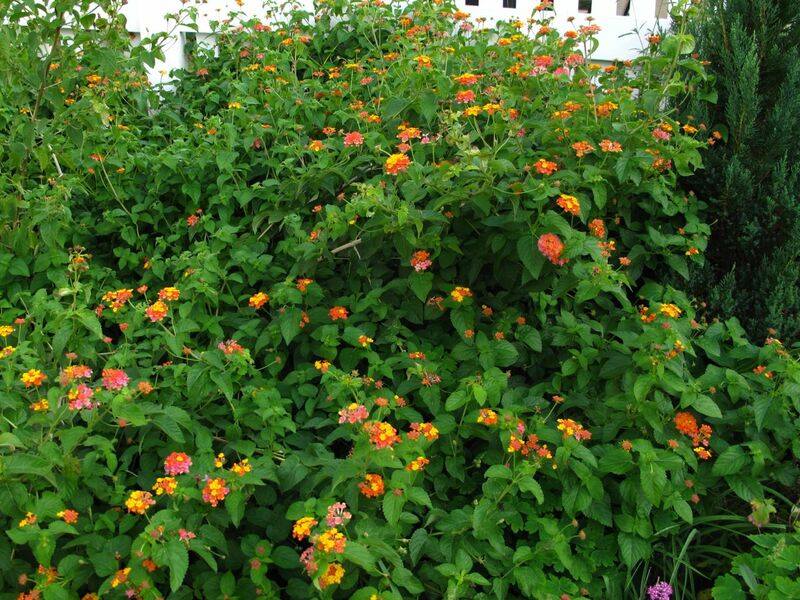 Is your Lantana in the ground? Does it survive frost? Eventually I hope to move the Euphorbia into the ground but finding room is always a problem! Yes, the lantana is in the ground. It will die back after first frost. I read once to leave the canes over the winter and prune them away in early spring. That’s worked for eleven years now. 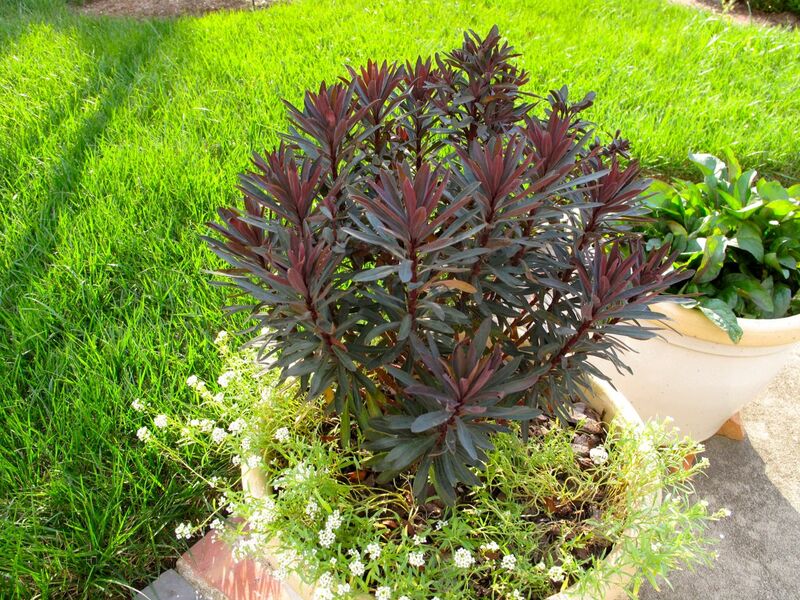 It takes up a lot of garden space during the summer, but is very easy. Lots of lovely flowers thanks to the rain, plants can exist to a certain extent without rain, but it is essential for flowers. Your lantana is huge, we are sold tiny pieces for hanging baskets! Just keep deadheading your buddlia and it wont be a problem seeding, it will also encourage more flowers to form! Thanks for the deadheading tip. There is a lantana sold here also for hanging baskets. Rain has really made an impact this year–I seldom water the garden except to help get plants established. The Angelonia have, indeed, been a treat this year. I’m going to try growing my own stock from cuttings in the greenhouse this winter. John, I confess I double-checked “anomalous” before I used it, but only wanted to get across the point that the last few years my garden by August, everything had dried up. Such a pleasant difference this year with extra rain. I can’t count on August to be like this next year though. 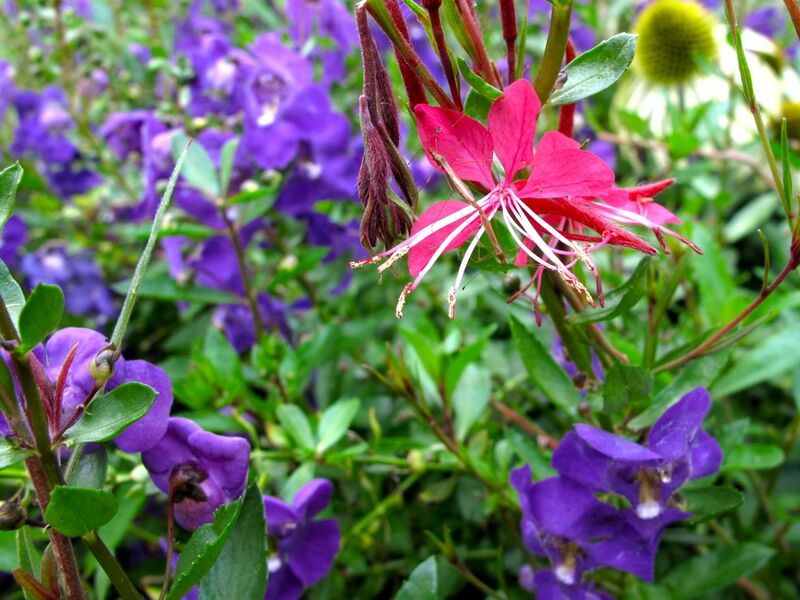 Angelonia is a wonder plant, isn’t it! Lovely combination of colors. Buddelja is considered an invasive plant up here too, but it is a great food source for butterflies and bees. In order to tame it, I have been cutting the spent flowers before they set seeds. I also cut the branches down to a foot above ground in spring so it won’t grow too tall. I’m not a very disciplined gardener so I should probably just remove the buddelja. I remembered to cut it back last year as you do yours, and it did much better this year (until the pine tree fell on it). It fill a void in the border right now. I do want to encourage butterflies but haven’t had very many this year. Your garden is looking wonderful. That salvia is stunning! Thank you! 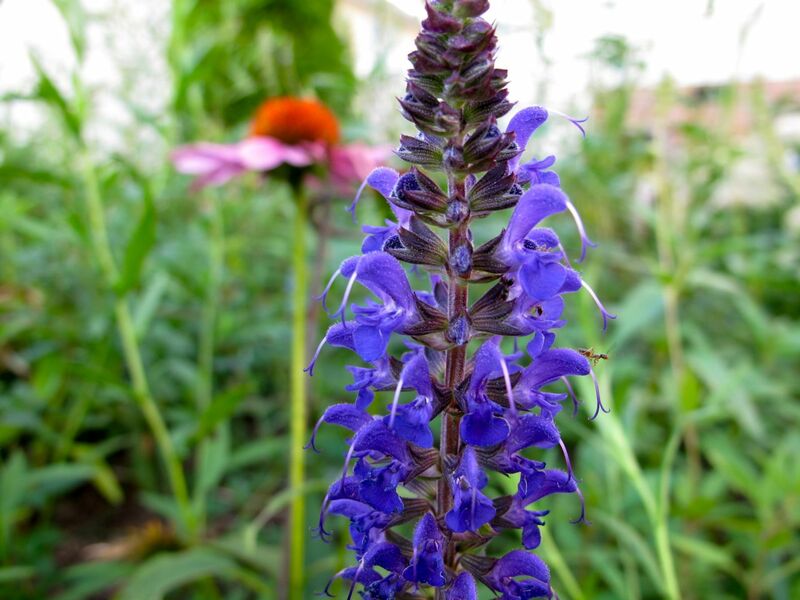 I like that salvia too–the color is so strong.